Disclaimer: I did receive Jim Cobb’s book for review however I only recommend products I like that I believe benefit my readers. All opinions are my own. When it comes to preparing your family for a crisis, disaster survival situation or even self reliance, it can get costly if you don’t know what you’re doing. However prepping for survival is an absolute necessity as far as I am concerned. Preparation is the key to surviving whatever life throws at you. Some people try to be prepared for short term situations because they usually think that no matter what happens life will go back to normal pretty quickly but history shows up that does not always happen. If you’re prepared to rough it without electricity or being able to run down to the store to buy food for only a day or two, you’re unprepared and that is a scary place to be. It is all too easy to push survival preparations to the back burner because let’s face it life gets in the way and it does take money to buy survival gear. The good news is you can take care of your survival needs even if you are on a tight budget. If you’re like most people, you don’t have a lot of money to spend on things that you don’t have plans to use right now. The key is to set a budget and stick with it. Make a list of the supplies you need, then watch for sales and buy a little at a time. Be sure to follow through with your plans and stick to your budget. 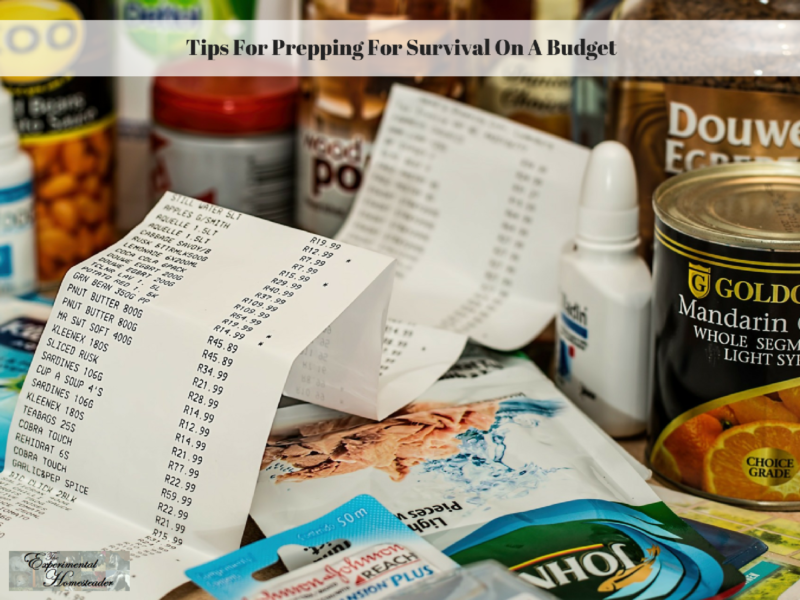 Below I share some great tips I have learned for prepping for survival on a budget. Have an inventory checklist so that you always know what you want to buy. This checklist is a great way to make sure you don’t end up buying more than one of an item – unless of course you need more than one. Carry a copy with you at all times so that if you see something on sale, you can cross reference the item with your list and know if you need to buy it or not. Not being familiar with the essential survival prepping products you need leads you to make mistakes because you end up buying items you don’t need instead of buying the ones you need to have on hand. Prepping means making sure you have enough supplies to make it in the event of a crisis that disrupts the ordinary way of life. That doesn’t mean you need to run out to a huge food store warehouse and start throwing cans of tuna in the cart. Not knowing for sure what you need to get is a fast way to end up short on supplies, not to mention it is a great way to waste the money you have. Having a successful survival method means that you have to take the time to make a through plan. You need to have a checklist of what to buy. There is no need to buy things your family won’t eat no matter how long they keep. This checklist should always start with the items that you must have first. There are many items you need – or simply want – for your prepper supply stash, however not every item is needed right away. These are the items that your survival depends on. Plan to buy the basics. Start with a basic food and water supply, since you can’t survive without either of these for very long. It is a good idea to also know what wild plants are edible – just in case. Your first step would be to aim to stock up a three day supply of food and water. You need to do this for every member of your family – including your pets. For your water supply, look for emergency water pouches or survival water pouches. These come in packets for easy storage and you can get them in a 3 day supply. That is your first goal. An alternative option to buying water for those who know how to can is to fill your canner with jars of water and process them right along with whatever food you are canning. Keep in mind however it is always a good idea to have a source of portable water just in case you need to leave your home. A portable survival water filter is another item to have on hand as you begin to stock up. Keep your plan focused to setting aside supplies for 72 hours, then move on from there. Once you have your water supply set aside, then move on to your food supply. Just like with the water, you want to make sure that you have a three day supply of food on hand. Figure this for each person. What you want to look for are the emergency food bars that offer around 400 calories a bar and come in different food flavors. Meals Ready-To-Eat also called MRE’s are a good option as are Survival Food Tablets. Add a prepping allowance into your budget then set this money aside for prepping inventory. If you have nothing extra after your regular bills, then cut something in order to provide for your prepping supplies. There are many ways to cut a budget that people don’t always think about. Get rid of a movie channel package or even consider selling something on eBay to free up some funds. You don’t want to get into debt buying up prepper supplies in a panic. A good alternative to cable or satellite TV is Amazon Prime or even Netflix. You can still enjoy watching TV but wont have such a large monthly bill. Consider swapping movies with other people you know who might have a movie collection. Coupons can help you with foods that you want to store. There are many guides that teach couponing and some people are able to buy groceries for pennies on the dollar with these savvy techniques. Of course, you can save a lot of money on your grocery bill by growing or raising your own food. For those who do not have the space, look into volunteering on someone’s farm in exchange for some of the crops or meat. Farmer’s Markets are another great option. I have found that going close to closing time means I can find bargains on large quantities of produce – however I do sacrifice selection. My solution is to go early one time, late another time. Half Price Books is a good place to shop for informative guides that might come in handy. This could include educational supplies for homeschooling, entertainment books, as well as guides on survival and homesteading. Look for the sale items they have and remember they do buy clean, used books so you could sell some that you are done with and buy new ones. When it comes to planning for your survival, it is easy to get caught up in what you think you have to have. This leads to unnecessary splurging, which on turn eats into the money you have to spend on what you really do need. As you start to prepare, you will find that you are faced with a lot of different choices. Some of these items are going to be worth you spending more money on, but some of the items are not. This is why it is so important to talk to other preppers or survivalists. Believe me they are going to speak up about products that don’t hold up or work like they should. If you are faced with a situation and you need to get out your house, you are going to need a way to carry a 3 day supply of food and water. You should have these items already set aside in a bug out or evacuation bag that is waiting for you to grab and go. These are referred to as evacuation bags, go bags, bug out bags or BOBs. These bags must be made of durable material. They need to be strong and water resistant. Buying a cheap bug out bag has the potential to ruin your supplies – so in this case, spend the money to get a good bag. What you want to look for are the bags that have good load bearing ability. Backpacks are ideal because they leave both of your hands free. Make sure there are no sticking zippers and that you choose one with lots of easy to access pockets for smaller items like knives, waterproof matches, etc. You also want to make sure that you have a good dependable communication system. This system could be your only link to knowing what is going on and it can be invaluable for helping you reach your loved ones. What you want to splurge on are communication devices such as a ham radio or world band radio. You might also want to consider a short wave radio. Splurge on a decent antenna and a solar charging system. Learn how to use these items before you have to so in an emergency situation you are already comfortable with the process. What you don’t want to splurge on are items that have a lot of features, can’t be carried along if you need to get out fast or don’t have a lot of bang for the buck. For example, you need a camp stove. You’ll want to splurge on a good one, but you don’t have to get one that has a ton of extras. A camp stove for $20 works just as well as the ones you can find for almost $100. An advantage of the smaller camp stoves is they are often lightweight, come in their own carrying bag and use whatever material you can find as fuel. For example, the one I have uses materials that are easy to find in nature – leaves, grass, small twigs, etc. When it comes to your eating supplies, you do want to splurge on organic heirloom seeds. This is the foundation of your survival once you have your short term supplies in place. This is what you will use to create your long term survival garden as well as keep you and your family fed for the future. Now if you are on the run, planting a garden is a lot harder, so choose seeds such as wheat grass that sprout quickly. There are many types of sprouts to choose from and they are a quick source of fresh, nutritious food. Buy at a pace you can realistically afford and learn what supplies you can make or grow yourself. You don’t have to go online and spend hundreds of dollars today. Make a short-term survival checklist and work on getting those supplies a little at a time first. Add to your supplies little by little, even if it means buying a single canned good with your regular groceries that week. Don’t buy the most expensive equipment because you think it will provide the best protection for your family. Start with the basics and later, you can upgrade your items if necessary and use the cheaper models as back-ups. Keep in mind that just like with any other type of consumer goods the highest price does not mean the best. Do your homework, talk to other preppers and read the reviews. Speaking of reviews for those of you out there who are bloggers or vloggers, many companies want people to review their items online. While you won’t get paid for this most of the time you can get the item for free or at a very reduced cost. This is a great way to start stockpiling your prepper supplies. Preparedness doesn’t need to cost an arm and a leg, but it will if you wait until the last minute not to mention that many items sell out quickly in a disaster situation or scare. The key is to gradually build up your supplies so it does not burden your budget and so you are not tempted to stop before you reach your goals. Here are some supplies to add to your “must-have prepper survival” list – again, buy these as your budget allows. Many of them such as the flooding knife, first aid kit or flashlights you might already own. Simply move them into your bug out bag so you know where they are. There is no need to buy more. First aid kit – you can buy this or make it yourself. I sell an eBook that gives many options for making your own, natural first aid kit. It makes sense when you are buying the way that you normally buy your supplies to buy just what you need. Buying groceries or other essential supplies weekly or even once a month is something many of us do. But buying supplies for survival prepping works better when you buy them in bulk. Retail stores and online stores always offer a better deal on supplies when you purchase them in bulk. You can easily pay around $15 for a 3 day supply emergency survival food bars – but if you buy them in bulk, you can often get a deal where you only pay $60 for a six month supply, so you end up saving $30. Now you do need to look around to find these deals – and pay attention to the expiration date on the package. Most emergency survival bars are good for 5 years, but there is a chance when you find them on sale that expiration date is almost up. The best areas to look for savings on bulk items are going to be in all your basic needs. You can save money by buying your water in bulk. You will save if you do the same for your food or seed supply, too. Be sure to buy open-pollinated, organic heirloom seeds so you only have to buy them once. Take the time to learn how to save seeds from the crops you grow. It is cheaper to buy seeds for a year or longer than it is for a few months. Since you need these items anyway, it makes sense to buy them in bigger quantities. If you know you want to buy a bulk item, set aside a little money at a time for a larger purchase. Also watch for sales where you can buy items in bulk. Many stores will offer double coupons or bulk purchase deals on items you need. Follow the lead of couponers who do save money on everyday purchases. You need a checklist when you are buying in bulk so that you don’t forget how much of each item that you have. Staples are where you will begin. Start by buying bulk packages of rice, beans, flour and sugar. Store these items in freezer bags in a freezer if at all possible. The second best place is a refrigerator. This keeps bugs out and helps keep the food fresh. At the very least, take them out of the containers they come in and put them in glass jars. You often find these in 50 pound bags. Sometimes smaller packages are plastic wrapped together enabling you to buy them in twin packs. For those with a grain grinder, buy wheat berries in bulk, but make sure before you buy, that you have proper storage containers in place to prevent pests from getting into your food. Freshly ground flour is more nutritious than pre-ground and doing it yourself saves a lot of money in the long run. It is also possible to grow your own wheat but be aware thrashing the wheat does take effort. Buying coffee and tea in bulk also cuts costs. Stock up on powdered milk, butter and eggs. Buy your canned goods by the case or better yet, can your own at home. You can canned goods in 12 to 24 can packs. Any food that you normally eat that comes in a can you want to stock up on. These canned foods are often good for many years from the date when you purchase them. Avoid buying dented or damaged cans for long term storage. Be sure to keep an eye on the expiration date and rotate them into your normal meal planning if necessary. Keep adding new canned food to your pantry so you always have plenty of food with a later expiration date. Besides making sure that you buy water and food in bulk, get your hygiene items this way as well. Stock up on supplies like shampoo and soap – or learn to make your own, razors, toilet paper, feminine products, diapers, deodorant, toothpaste and lotion for dry skin. Stock up on detergent and bleach – especially bleach – because it can be used to disinfect. Getting your medical supplies in bulk will save you money, too. You need to create a store of bandages, gauze, medical tape, disposable gloves, compress, thermometer, antibiotic ointments, a first aid kit, wraps, medication to treat sickness or injuries, tweezers, eye drops, sunburn cream, insect bite and poison ivy treatments. Add some essential oils to this kit or make your own homemade first aid kit using natural supplies. It’s true that we often have an all or nothing mentality. When it comes to making sure our needs or the needs of our loved ones are met, our natural desire is to go all out. With survival prepping, being fully prepared can be expensive. Fortunately, you don’t have to buy every one of the supplies that you will eventually need all at once. Buying what you would need to survive for the first 72 hours is a good start and you don’t even have to buy that all at once. Start by focusing your spending power on getting enough water and food for everyone in your household for one day. Then stock for the second day and so on. Once you have reached your store of three days worth of supplies, then start adding to your arsenal until you are hoarding enough for a week, a month, three months, and finally, a year or more. Start your long-term food supply by looking at it like you are going grocery shopping and get the items that you would normally buy at the store but buy them in bulk or use coupons. Many stores offer a buy one get one free sale or even a 10 for $10 sale. If you don’t have a food warehouse membership, that is not a problem, you can buy what you need online, look on food warehouse websites for coupons that allow you admittance on one day for free or even ask friends or family if they can take a guest with them. Don’t feel you have to stick with one supply at a time, such as buying several 25 pound bags of rice until you have a supply. Ideally you want to concentrate on getting some items from each category of the supplies you need and then rotate back through it again. For example, you would buy your staples one week, making sure you get a large bag of rice. Then the next week, you would buy the flour, then after that the sugar and within weeks, you would have your staples knocked off your list. That is the way that you would handle every category. Remember to buy your hygiene items too, because you will need those things. When you write your list of supplies, put a heading for each area you need to cover for your survival. After food and water, you should have areas marked as tools, shelter, communication, purification, heat and so on. Under the heading of tools, start stocking up on items like knives, self-defense weapons, multi-tools, an axe, binoculars, shovel, paracord, flashlights, fishing gear, fire starter, manual can opener, cast iron pan and more. For shelter, you would want to make sure you have a supply of Mylar emergency thermal blankets, sleeping bags, a good tarp and tents. Weather gear can go into that category as well. This would be items like a poncho, rain boots, etc. Purification methods are needed because if you find water you need a way to purify it so you don’t get sick. Some of the methods used to purify water are filters or water purification tablets. It is a well known fact that when a crisis is raging, there is often panic among the masses. One of these reasons is because the media will often hype up situations in order to drive up the ratings. This works because what it does is it whips people into a frenzy and they make a run on supplies. You have probably seen empty grocery store shelves during times of uncertain weather. When this is going on, it will often create a state where the demand will exceed the supply, which in turn only fuels more panic. What retailers do in response to this panic is they will jack up the prices. While it is wrong of them to feed on people’s fears, it is simply what they do and it has been done time and time again everywhere. So while you do want to make sure that you get all the supplies that you need to have your survival preparation supplies on hand, you want to be careful as far as the timing goes. By paying attention to certain times and what is going on in the world around you, you can save money. When the news is all about doom, gloom and panic, you should not buy any of your prepper supplies. You will end up being overcharged and the state of panic all around you might cause you to buy items you don’t need. The time to purchase supplies for your survival prepping is when life is business as usual. This way, you won’t pay more than you should. A good time to buy your necessary supplies is during times when there are sales. Throughout the year, various retailers will hold sales. During certain times of the year, certain foods are on sale. After the holidays, it is possible to find dried fruit or chocolate on clearance. While some might consider these items to be a non-necessity, dried fruit is always nice and dark chocolate has health benefits. You will see sales on holidays like Black Friday, Cyber Monday and other days. Watch for the supplies you need to go on sale then, especially if they are the more expensive items. Pay attention to in-store sales, discount sales and bulk buying sales. You can usually find something on sale in every one of the categories on your list. Keep it handy, updated and carry it with you at all times just in case. Week 1: Look for nuts at the after Christmas sales. They may be 50% or more off. The dry roasted ones store best, but you can freeze nuts as long as you put them into a freezer bag. Try to buy at least two pounds per person. Week 2: Look for cleaning supplies. An average is one gallon of bleach per person. The average person does 156 loads of laundry per year, so stock up on enough laundry soap to get by for the year. Also look for other types of cleansers at this time unless you make your own. If you do, take time this week to stock up on supplies you need to make your own cleansers for the upcoming year. Week 3: This is a good time to stock up on needed supplies such as feminine products, sunscreen, over-the-counter medicines, cough drops and syrup. Dispose of the outdated medications in your medicine chest. If you make any of your own salves, creams, etc. take this week to stock up on supplies you will need over the coming year. Week 4: Is a good time to continue to stock the medicine chest with products such as Band-Aids, antibiotic ointments, Ace Bandages, steri-strips and other first aid needs. Week 5: Is the time to stock up on personal products such as soap, deodorant, toilet paper, shampoo, lotion, hand soap, etc. An average on hand soap is fifteen bars per person. Again, if you make your own, use this week to stock up on supplies you will need. Week 6: The only thing you need to stock up on this week is peanut butter. Buy ten pounds per person. Peanut butter has a long shelf life, so if you overbuy, it will keep. Week 7: Stock up on oils, remember the FDA says 60 pounds per person per year. Solid shortening is less expensive than oils. Keep your oils and shortenings rotated so the ones that expire first are used first. These products have a long shelf life and will generally last several years especially if they are kept in a cool, dark place. Week 8: This is a good time to look for 100% pure juice. Do not buy watered down versions. Get 100% pure lemon, orange, pineapple or whatever flavors you like. If you can your own juice, this may be a good week to look for canning supplies instead as fruit this time of year can be expensive. If you do find a good sale, by all means, stock up. You can juice fruit any time of the year. Week 9: Look for personal grooming supplies this week. Seek out sales on toothpaste or baking soda if you make your own. This week is a good time to buy floss, razors, shaving creams and other personal grooming items your family may use. Many personal grooming items can be made at home for a fraction of the cost plus they don’t have all the chemicals in them. Week 10: If you bake from scratch, week ten should include items you need to make mixes. You can pre-make packages of cookie mix, cake mix, biscuit or bread mix, vacuum seal them and freeze them for later use. If you do not bake from scratch, pick up the mixes you use this week. Store these types of items in the freezer just as you would flour and sugar. Keeping them cold will prevent them from getting buggy. Week 11: This is a good time to stock up on herbs and spices. Look for ones you don’t grow that are on sale. If you grow everything along this line that you need, buy seeds this week. Don’t forget to stock up on iodized salt and peppercorns. Fresh ground pepper is best. Week 12: If you eat rice, stock up. Buy as much as twenty pounds per person. White rice stores better than brown rice, but you can keep this in the freezer or refrigerator, which will help prevent bug infestation. Week 13: Add more supplies to the first aid box this week. Look for gauze patches, swabs, cotton balls, first aid tape, etc. Old fashioned Kotex is good for wounds. Sanitary napkins with adhesives do not store as well as the non-adhesive kind. If you don’t want to keep a lot of supplies around, buy gift cards or set money aside for purchasing supplies later in the year if they are needed. A two to three month supply should be fine. Week 14: Stock up on pasta or make your own. A good average is five pounds per person. Week 15: Buy dry milk this week and keep it in the refrigerator. Buy enough dry milk for baking, cooking, etc. throughout the year. Remember many recipes, such as homemade bread, call for dry milk. Week 16: If you don’t have a sewing kit, now is the time to get one. If you do, take stock of your thread, pins, needles, buttons, snaps, zippers, tape measure and scissors. Consider your family’s needs and if there are clothes no longer fit to wear, remove buttons, zippers, or other useful parts and use the cloth for rags or use them in crafts. Old clothes, especially jeans, make interesting rag rugs. Week 17: Ready to eat dinners are not the best in the world health wise, but they are convenient. You can put some of your own food up in small canning jars or buy things such as Ravioli, pasta, Oriental meals that are boxed, canned or frozen. Buy what your family will eat and remember these make great lunches or meals on the go. Week 18: Stock up on flour this week. Be sure to put the bags into freezer bags or if you bought too large of bags, break them down. Label the freezer bags so you know what you have later on. Freezing flour keeps it fresh and keeps the bugs out. An alternative is to buy or grow wheat. Do not grind the berries until you are ready to use them, just freeze them whole. Week 19: Stock up on dry or canned soup, or can your own. Don’t forget to buy crackers or make sure you have the supplies to make your own. Week 20: Gelatin and pudding mixes are great things to have on hand for snacks. Stock up on these items this week. The powdered mixes freeze well. Week 21: Don’t forget to buy extra garden seeds as well as the normal ones you would buy. Radish and lettuce are great in an emergency. Buy locally if you haven’t ordered yet. Avoid genetically modified seeds and look for heirloom, organic seeds. Week 22: This is the week to stock up on cord, twine or rope. Buy an extra flashlight that will work using different types of batteries. Don’t forget to buy rechargeable batteries and an extra battery charger, if you don’t already have two of them on hand. Week 23: Don’t forget the cheese! Look for powdered cheese, whole blocks of cheese and small packages of pre-grated cheese that is on sale. Freeze the grated cheese to use in cooking. Week 24: Paper products such as paper towels, aluminum foil, garbage bags, freezer bags and toilet paper are pretty much necessities you will need to buy. Stock up on these items this week. Week 25: If you are making your own condiments, buy items you will need such as spices you do not grow, extra canning jars or lids. If you do not make your own, stock up on items such as mustard, ketchup, mayonnaise and similar items this week. Week 26: If you need new towels, bedding or blankets, watch for the white sales this week and stock up. Also check the clearance section of higher priced stores. Sometimes you can get a really good deal on a high quality item and if you can pair that with percentage off coupons, you save even more! Week 27: If you make jams and jellies, stock up on Sure-Jell, Certo, parafin, canning jars, lids and other necessities. You may want to buy varieties of jams and jellies that you will not be making. Week 28: Fill glass containers that seal with water this week. A better way is to add canning jars full of water to the canner every time you can, if there is an empty space. Week 29: If you use canned milk, buy it this week. Be sure to pay attention to the date on the cans. Week 30: Stock up on canned goods this week. Look for items you will not be canning or ones you think you will run out of. Look for canned meat as well. Week 31: Stock up on school and office supplies such as paper, pencils, journals, envelopes, ink or postage stamps. Remember these items can be used as stocking stuffers at the end of the year if they are not used up, or kept for the following year. Week 32: Stock up on staples this week such as baking powder, corn starch, baking soda, etc. If you make your own, use this week to stock up on supplies you may need. Week 33: If you need tomato items, get them this week. Buy juice, sauce, whole tomatoes, paste, salsa or make your own products and can them. Be sure you have citric acid or lemon juice for canning tomatoes. Week 34: Buy or can fruit this week. Stock up on canning supplies if you are canning. Look for sales on fresh or frozen fruit and stock up. Week 35: Stock up on sugar this week. Bag it or put it in freezer bags and label. You can save a lot of money by buying sugar in bulk and packaging it yourself. Keep it in the freezer to discourage bugs. Week 36: Can or freeze vegetables from the garden or vegetables that have been purchased fresh, or buy canned vegetables. Week 37: Stock up on dry beans, peas or legumes. Week 38: Stock up on sweeteners this week such as honey, Karo, molasses, maple syrup, etc. Week 39: Stock up on canned meats such as tuna, Spam, dried beef, chicken, etc. or can your own. Week 40: Buy plenty of iodized sea salt and pickling salt this week. Salt is used as both a preservative and a seasoning. In a pinch it can be used as a toothpaste or as a de-icer. Be sure to keep plenty on hand. Week 41: Stock up on both white and apple cider vinegar. There are many uses for vinegar from using it on bug bites such as bee stings, to rinsing your hair, especially if you have been exposed to lice, to cleaning and whitening clothes. Week 42: Buy canned soup when it is on sale or make a big pot and can some for lunches, suppers, emergency meals. Week 43: An apple a day is said to keep the Dr. away, so stock up on them and then do something with them! Make pie, applesauce, apple juice or can them for later use. Apples are easy to dehydrate as well and make a quick snack. Week 44: On sale after Halloween, hard candy can be frozen. Leftovers will make a good addition to your 72 hour emergency kits and hard candy makes great stocking stuffers! Week 45: If you use vitamins, stock up now. You need 365 vitamins per person. Get extra C vitamins and calcium with Vitamin D.
Week 46: Stock up on baking treats such as cocoa, baking chocolate and chocolate chips. Freeze coconut to keep it fresh! 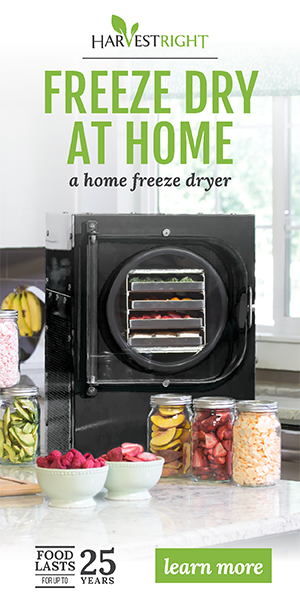 Keep these items frozen or refrigerated to extend their shelf life. Week 47: If you aren’t growing enough grains, stock up this week. Look for rolled oats, corn meal, spelt, whole grain cereals, etc. Keep these items frozen or refrigerated to extend their shelf life. Week 48: Stock up on more sugar, white, brown, powdered and remember to freeze it. Week 49: Stock up on vegetable and olive oils this week. Store them in a cool, dark place. Week 50: Buy candles and matches, look for sales on candles. Put them in a sturdy, fireproof box and in a cool place you can locate in dark. Week 51: Buy large quantities of popcorn and store it in the freezer or refrigerator. Week 52: Watch for holiday sales and stock up on any items you still need or want! Survival and prepping is something every household should be doing, regardless of their level of income. Dire situations don’t discriminate when it comes to wreaking havoc on society, and you want to be just as ready as your neighbors (if not more so) when anything causes you to go into bug out mode. No amount of prepping is too small. If all you can buy is an extra 3 pound bag of rice, then do it. A couple of cans of soup here and there is also a start. Do not wait until you have plenty of extra money to buy everything all at once. Natural or man-made disaster can strike at any time – and in any place. Remember that being informed is half the battle because if you don’t know what to buy you will spend a lot more than you need to. Do a lot of reading and talk to other survivalist preppers. A great book that will help you is the Prepper’s Financial Guide by Jim Cobb. It covers important prepper topics such as debt reduction, bartering, trading and so much more. I really encourage you to pick up a copy of this book. Are You Ready To Start Becoming A Survivialist? I love your detailed post about prepping… especially on a budget. This is laid out step by step, easy for me to understand! As you mentioned about buying, specifically timing when you buy something… that can save you some money. What came to my mind is: Stock up on pumpkin seeds after halloween, nuts after christmas, and thanksgiving essentials just after thanksgiving (i’d say discounted turkey which you can freeze-dry or dehydrate). Thank you so much! Did you get the 52 week stocking up downloadable list? There are definitely certain times of the year to stock up on certain items. Don’t forget candy after both Halloween and Christmas. Most MRE’s do contain some type of candy so they are balanced meals.